There we were, a small group of New England Literary scholars, packed tight in a Dodge Caravan, with all the essential tools of transcendentalist tourist-explorateurs: Sarah Orne Jewett novels (at least one copy per person of Country of the Pointed Firs) favorite poetry collections, plenty of pens, journals full of pages (some full of words, some waiting to be filled), headlamps (for optimum reading time, and investigating) and 1 novelty item each: a cowboy hat for Iris, pulp fiction for Dana, a Maine mug for Torrey, striped lobster apron for Jessie, and 3 squirt guns...and a sand castle bucket...and a shovel...and...um... a badminton set... for me. These items had been recently acquired on a sidetrip to Maine's everything store, Renny's, in an attempt to experience some of the local flavor. We had just hit a low point in the drive, after everyone had shared their respective tales of tragic romances, star-crossed lovers, or the (at least) equally tragic, lack-thereof. We turned to Mrs. Todd and Cap'n Jameson for solace, but were rather in need of something to lift our spirits. When, there, on the side of Rte. 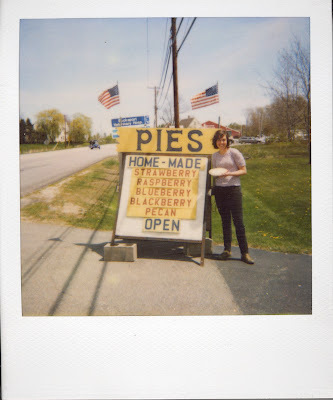 1, just out of Bucksport, we spotted an omen which indicated an easing of our woes... 'PIES,' the sign read, "Homemade, Strawberry, Raspberry, Blueberry, Blackberry, Pecan..." and the clincher... "OPEN". I made a sharp right turn into the driveway, simultaneously asking if the rest of our voyageurs were game..."YES! was of course the resounding answer." 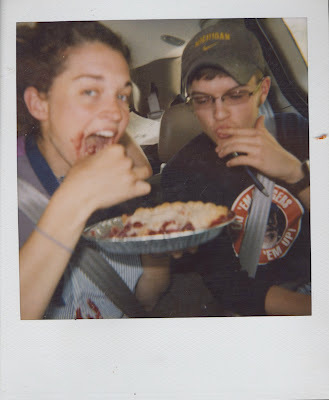 We emerged from the van, pens, journals, polaroid camera in hand, but it was unclear where said homemade pies could be acquired. There was a house with an 'hours' sign, though, so I marched up to the door and knocked. I opened the door and tried a timid "hello? "...no response...so in I walked, posse behind me, through a sunroom until we arrived at the threshold of what appeared to be a kitchen. There we spotted 3 pies on a rack....and a tall and solid older man (we were later to learn his name was Stanley) standing before them, eating fried clams. Before any business dealings, he shoved his lunch plate in my face, making me try a fried clam, "Evah had clahms befah?" he asked. I then noticed that he was wearing an oversized sweatshirt with a large deer depicted in American flag print, reading "America's Favorite Pastime." I said I wasn't sure if I'd ever tried them or not, which certainly struck him as out of the ordinary. "Ah you from away?" We said yes, that we were from Michigan. "Michigan! whatcha doin' aht here fah?" he responded. "Well, we're reading New England Literature..."
"Lit-ra-cha? What is it, pohnography ah somethin'? Gotta come aht here and read it in the woods?" We told him that no, though Thoreau could perhaps benefit from some saucier passages, it was indeed not X-rated. We claimed that we wanted to immerse ourselves in the places we were reading about. "Whatcha gotta do that fah? I thought lit-ra-cha was supposed to transport ya to where ya s'pposed ta be." Uh...oh...yeah...with that, he had us cornered with a hit to NELP's jugular. We suddenly realized our urgency to set off on our way toward the cliffs of Acadia, and got down to business. We opted for a raspberry pie, which we learned, was made by his wife Priscilla, who had been baking for at least 55 years. She was unfortunately not at home. 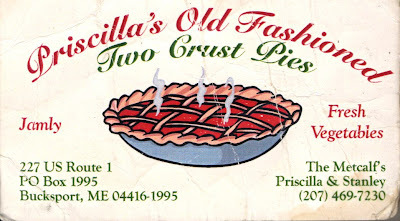 We scampered out the door, thanking him for the pie and fried clam, grabbed a business card on the way out, took some polaroids by the pie sign and were off. Pie-eating in a mini-van full of literary equipment and sans the proper-pie eating tools proved difficult, so we dug in, literally, by the handful. Singing and eating and sullying our faces all the way to Mt. Desert (Dessert?) Island. Warm memories. 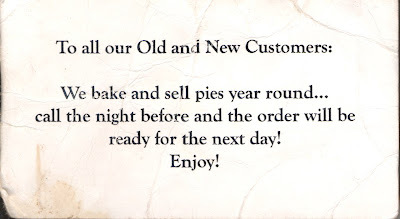 Warm, flaky, golden brown memories. Whoops, got some memory on yer face there, Jessie.